Consecration is the act of dedicating all to the building up of the kingdom of God on earth. This is what Mormonism calls a "Celestial Law." That is, it is lived by those who are keeping the highest, most exalted laws of God. Living the Law of Consecration is closely tied with living according to an economic system called the United Order, which enables the poor to rise in their standard of living until there are no poor among the people. This order was followed by the early members of Christ's Church in Jerusalem under the direction of the apostles -- there were no poor among them. The order was also followed by the Book of Mormon peoples for over 200 years. The Lord often requests the righteous who follow Him to consecrate their lives to His service. This is not the same as eschewing marriage and family to serve the Church, since marriage and family are ordained of God for all mankind. It also does not entail cloistering oneself away from society. It means to use our time, talents, and resources to build up the kingdom and prepare for the Second Coming of Christ. Purification is part of consecration. Keeping the commandments of God and living according to His word prepares a person to consecrate himself. Young missionaries consecrate their time to the Lord's service for 18 months to two years. This takes preparation. Missionary service is paid for by the missionary, his or her family, and anonymous donations. Education and work, even hobbies and relationships, must be suspended during this period of consecration. 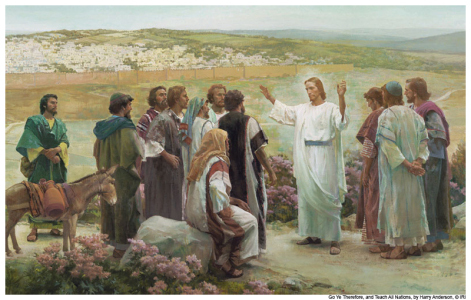 A wonderful thing about The Church of Jesus Christ of Latter-day Saints is that it is guided personally by Christ, who advises temperance and measured steps in keeping His commandments. The time of service does not extend for more than two years, and that's what the Church requires. No one is asked to run if he can only walk. Consecration is an attitude as well as an observable act of goodness. • Doctrine and Covenants 42:30-31—30 - "And behold, thou wilt remember the poor, and consecrate of thy properties for their support that which thou hast to impart unto them, with a covenant and a deed which cannot be broken. And inasmuch as ye impart of your substance unto the poor, ye will do it unto me; and they shall be laid before the bishop of my church and his counselors, two of the elders, or high priests, such as he shall appoint or has appointed and set apart for that purpose." The blessing of the poor and needy is a demonstration of pure religion, as if we had done it unto our Savior Himself (see Matthew 25:40; James 1:27). • Doctrine and Covenants 105:5 — "And Zion cannot be built up unless it is by the principles of the law of the celestial kingdom; otherwise I cannot receive her unto myself." Zion (the pure in heart; the New Jerusalem during the Millennium) is comprised of those who are willing to consecrate everything - their time, talents, and substance - to the Lord's work. • Mosiah 4:21 — "And now, if God, who has created you, on whom you are dependent for your lives and for all that ye have and are, doth grant unto you whatsoever ye ask that is right, in faith, believing that ye shall receive, O then, how ye ought to impart of the substance that ye have one to another." Consecration requires the overcoming of the worldly desires of power and greed, as well as idleness. This is why it has always been difficult to live the law of consecration in its fullness save the people were of one heart, and — as the Lord directs — equal in all things and sharing them in common. Having things in common brings forth the blessings of the Spirit (see Acts 2:43-44; 4 Nephi 1:3; also 3 Nephi 26:19; D&C 70:14). Saints must keep the covenant of consecration. The Lord has blessed us as a people with a prosperity unequaled in times past. The resources that have been placed in our power are good, and necessary to our work here on the earth. But I am afraid that many of us have been surfeited with flocks and herds and acres and barns and wealth and have begun to worship them as false gods, and they have power over us. Do we have more of these good things than our faith can stand? Many people spend most of their time working in the service of a self-image that includes sufficient money, stocks, bonds, investment portfolios, property, credit cards, furnishings, automobiles, and the like to guarantee carnal security throughout, it is hoped, a long and happy life. Forgotten is the fact that our assignment is to use these many resources in our families and quorums to build up the kingdom of God--to further the missionary effort and the genealogical and temple work; to raise our children up as fruitful servants unto the Lord; to bless others in every way, that they may also be fruitful. Instead, we expend these blessings on our own desires, and as Moroni said, “Ye adorn yourselves with that which hath no life, and yet suffer the hungry, and the needy, and the naked, and the sick and the afflicted to pass by you, and notice them not” (Mormon 8:39). 1. Remember to keep in mind the eternal purposes of Heavenly Father. 2. Remember the goodness and mercy of God to His children. 3. Set some goals and make some plans to live a consecrated life. 4. Follow a pattern of consecration. Whenever Church members speak of consecration, it should be done reverently while acknowledging that each of us “come[s] short of the glory of God,” some of us far short (Romans 3:23). Even the conscientious have not arrived, but they sense the shortfall and are genuinely striving. Consolingly, God’s grace flows not only to those “who love [Him] and keep all [His] commandments,” but likewise to those “that [seek] so to do” (Doctrine and Covenants 46:9). "The law of consecration demands everything you have, but at the same times it fills your every physical need." This is true of the United Order. A person entering the United Order presents all that he owns to the Bishop. He then assesses to the Bishop the needs and desires of his family, which the Bishop deeds back to him. This becomes the person's private property and stewardship. If his needs increase, his portion is then enlarged. Excess is distributed to the needy, thus debasing the rich and elevating the poor. This is not the same as communal ownership, since one's property is his own. He is just consecrating his excess for the good of the poor. The living standard of all involved increases together. We covenant to live the law of consecration. This law is that we consecrate our time, talents, strength, property, and money for the upbuilding of the kingdom of God on this earth and the establishment of Zion. Until one abides by the laws of obedience, sacrifice, the gospel, and chastity, he cannot abide the law of consecration, which is the law pertaining to the celestial kingdom. . . . Adapted from What We Need to Know and Do, by Ed Pinegar and Richard J. Allen. This page was last edited on 16 November 2011, at 23:39.